T.I. 's 'Paper Trail' A Testament To Writing The Atlanta rapper has picked up a pad of paper for the first time since 2001 (a change from writing and keeping his lyrics in his head), and the result is a blur of intricately constructed rhymes. Paper Trail is an intensely personal album with a couple of commercial smashes muddying the waters; on the posse cut "Swagga Like Us," T.I. raps circles around three of the most popular rappers in the world. When Jay-Z speaks, the rap world listens. So when, around the turn of the decade, he began publicizing that neither he nor his late friend The Notorious B.I.G. wrote their rhymes on paper, many rappers followed suit. Tattered notepads turned obsolete, as many artists instead began committing raps to memory or constructing them off the cuff in the studio, one line at a time. Jay-Z once jokingly told MTV that "I've inspired a generation of bad writers," but listeners can only speculate as to how it may have affected the good ones. Atlanta's T.I., who says he put the pad down in 2001, returns to the written word for his sixth album, Paper Trail — and it shows. But Paper Trail isn't strictly a lyrical exercise. Primarily recorded on house arrest while the rapper was awaiting trial on illegal-weapons charges, the record represents T.I. at his most vulnerable. "You Ain't Missin' Nothing" serves as an anthem for his would-be cellmates, and he almost gets apologetic in the midst of rationalization in "Ready for Whatever." There's also a whole lot of hand-wringing about unwanted celebrity attention in light of the arrest, though T.I. effectively sells his case through sheer charisma. He's since pleaded guilty to all charges in exchange for just one year of jail time, to be served after the completion of 1,000 hours of community service, so maybe the benefits of fame actually do outweigh its trappings. T.I. sounds less compelling when he strays from the theme, bending to tired hip-pop trends not befitting a performer of his stature. The Euro-club sampling craze is taken to its bizarre extreme on "Live Your Life," on which guest Rihanna borrows her obnoxious hook from Moldovan pop group Ozone, while "Whatever You Like" serves as T.I. 's transparent attempt to recreate Lil Wayne's "Lollipop" success, complete with mumbled, off-key singing. Both records are already commercial smashes, but they undermine what should have been an intensely personal album. T.I. 's prison sentence should offer plenty of time for introspection, so here's hoping he brings his pen to the pen. 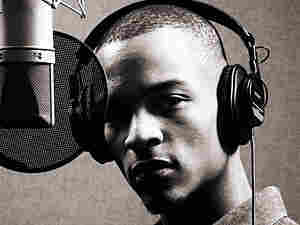 Purchase Music“Paper Trail” by T.I.